For the Atlantic coast of the US, hurricane season runs from the beginning of June to the end of November. North Carolina is certainly no stranger to hurricanes, and has historically taken the brunt of many a storms' landfall. Charlotte sits about 200 miles from Myrtle Beach, S.C., Charleston, S.C. and Wilmington, which are all hurricane hotspots. Many of the storms that make landfall in these coastal communities end up affecting Charlotte. Due to its size and numerous accommodations, Charlotte also serves as an evacuation point coastal residents in both North and South Carolina. From 1851 to 2005, North Carolina has been hit by close to 50 hurricanes - 12 of them could be considered "major." Twenty two of these hurricanes were a category 1, 13 of them a category 2, 11 were a category 3 and one was a category 4. A category 5 hurricane has never hit North Carolina directly, but experts say it's certainly possible. The following is a brief history of some of the largest hurricanes to hit North Carolina. 1752: In late September of 1752, a hurricane ravaged the North Carolina coast, destroying the Onslow County seat. An eyewitness from the Wilmington area stated that "the wind blew so hard it stemmed the Gulf Stream in its northern course and threw it on the shores. At 9 o'clock the flood came rolling in with great impetuosity and in a short time the tide rose ten feet above the high water mark of the highest tide." 1769: A hurricane struck the North Carolina Outer Banks in September. The colonial capital of the time (located in New Bern) was almost completely destroyed. 1788: A hurricane made landfall on the Outer Banks and moved into Virginia. This storm was so notable that George Washington wrote a detailed account in his diary. Damage was severe at his home in Mount Vernon, Virginia. 1825: One of the earliest recorded hurricanes (early June) brought incredibly damaging winds to the state. 1876: What became known as the "Centennial Gale" moved through North Carolina in September, bringing heavy flooding to the coast. 1878: Another heavy storm, the "Great October Gale," roared into the Outer Banks in October. Winds of over 100 miles an hour were recorded at Cape Lookout, near Wilmington. 1879: A hurricane in August of this year was among the worst of the century. Devices for measuring wind speed were shattered and destroyed from the sheer force of winds at Cape Hatteras and Kitty Hawk. This storm was so intense that the state's governor, Thomas Jarvis, was forced to flee. 1896: A September hurricane made landfall far south from the Carolinas, in the northern portion of Florida. The storm remained unusually strong though, and 100 mile an hour winds damage was reported as far north as Raleigh and Chapel Hill. 1899: The "San Ciriaco Hurricane" would make its way through the Outer Banks in August of this year, flooding portions of the Hatteras community and other barrier islands. Diamond City, the state's lone whaling community, was destroyed in the storm and would be abandoned. Over 20 deaths were reported. 1933: After over 30 years of relative quiet, two strong storm would strike the coast of North Carolina, one in August, one in September. Over 13 inches of rain was dumped on the Outer Banks and wind gusts of over 100 miles per hour were reported across the region. 21 deaths were reported. 1940: In August, a hurricane snaked through the region after making landfall in South Carolina. Widespread flooding occurred in the western part of the state. 1944: In September, "The Great Atlantic Hurricane" came ashore on the Outer Banks, near Cape Hatteras. Two Coast Guard ships, the Bedloe and the Jackson, were destroyed, resulting in the death of almost 50 crew members. 1954: In October, one of the century's most intense storms, Hurricane Hazel, would sweep inland, near the North/South Carolina border. The storm coincided with the highest tide of the year. Many beach communities were devastated. Brunswick County saw the worst devastation, where most homes were either completely destroyed or damaged beyond inhabitation. In the town of Long Beach, only five of the 357 buildings were left standing. Approximately 80 percent of oceanfront homes in Myrtle Beach were destroyed. According to an official report from the Weather Bureau in Raleigh, "all traces of civilization on the immediate waterfront between the state line and Cape Fear were practically annihilated." The NOAA report on the hurricanes of the year stated that "every pier in a distance of 170 miles of coastline was demolished". Nineteen fatalities were reported in North Carolina, and several hundred more injured. 15,000 homes were destroyed, and close to 40,000 damaged. Damages in the state amounted to $163 million, with beach property accounting for $61 million of damage. 1955: Three hurricanes, Connie, Diane and Ione would make landfall in a six week period, causing record flooding on the coastal regions. The Outer Banks town of Maysville reported close to 50 inches of rain combined from these three storms. 1960: Hurricane Donna would hit Cape Fear as a category 3 hurricane, and remain a hurricane throughout it's journey through the state. Sustained winds of almost 120 miles per hour were reported at Cape Fear. 1972: A hurricane named Agnes hit Florida Gulf Coast, before moving through the southern states. Torrential rain poured on the western half of North Carolina, causing extensive flooding. Two deaths would be reported. 1989: Another of the most intense storms in recent history, Hurricane Hugo made landfall in Charleston, S.C. in September. The storm retained an incredible amount of strength, and the storm traveled much farther inland than normal. Since that time, many people have asked, "Was Hugo a hurricane when it came through Charlotte?" Since the storm was right on the cusp of the category when it came through the region, there has been debate as to whether or not the storm qualified as a hurricane depending on who you ask. As far as an "official" answer, as the eye of the storm passed over the center city of Charlotte, the storm did qualify as a hurricane (sustained winds of over 80 miles an hour and gusts of over 100). Thousands of trees were felled, and power was out for weeks. Hugo remains one of the most devastating hurricanes to hit the Carolina coast, and certainly the most devastating to Charlotte. Although many people believe the mascot of the NBA's Charlotte Hornets, Hugo, would take his name from this storm, it did not. Ironically, Hugo the Hornet was created one year before the storm hit Charlotte. 1993: Hurricane Emily was a category 3 storm when it approached the Outer Banks. The storm was headed inland, but turned out to sea at the last moment, brushing the coast. Still, close to 500 homes were destroyed in Hatteras, and power was cut to the island when officials feared numerous downed power lines would start fires. Flooding left a quarter of the population homeless. Only two deaths were reported, however – swimmers at Nags Head. 1996: Hurricane Bertha struck North Carolina in July, and Hurricane Fran in September. It was the first time since the mid 50s that North Carolina had experienced two hurricane landfalls in one hurricane season. Bertha destroyed several fishing piers and marinas in the Wrightsville Beach area. Due to the devastation from Bertha, the police station in Topsoil Beach was housed in a double-wide trailer. Flooding from Hurricane Fran would actually carry the police station away. The Kure Beach pier was destroyed, and even historic buildings far inland, at N.C.
State University and the University of North Carolina, were damaged. At least six people were killed in the storm, most of these from auto accidents. The Topsoil Beach area was hit the worst by Fran, with over 500 million dollars of damage reported, and 90 percent of structures damaged. 1999: Hurricane Dennis reached the coast in late August, followed by Hurricane Floyd in the middle of September, followed by Irene four weeks later. 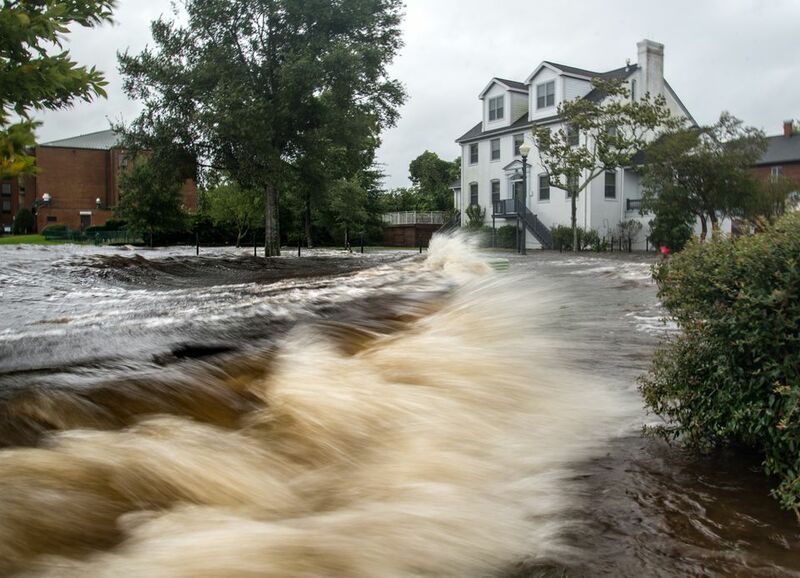 Even though Floyd made landfall just west of Cape Hatteras, it continued inland and dropped close to 20 of rain in many parts of the state, causing record flooding and billions of dollars in damage. 35 North Carolina deaths would be reported from Floyd, most from flooding. 2003: On Sept. 18, Hurricane Isabel crashed into Ocracoke Island and continued through the northern half of the state. Widespread flooding caused many power outages. Damage was heaviest in Dare County, where flooding and winds damaged thousands of homes. The storm actually washed away a portion of Hatteras Island, forming "Isabel Inlet." North Carolina Highway 12 was destroyed by the inlet forming, and the town of Hatteras was cut off from the rest of the island. A bridge or ferry system was considered, but ultimately, officials pumped in sand to fill the gap. Three North Carolina fatalities would be reported as a result of the storm.